Cory Swanson, owner of Swanson Roofing in St. Joseph, Ill., can tell without even stepping out of the truck whether a roof has multiple layers of older material under the surface. “It’s like someone with two pairs of socks on,” he says. When he started out 20 years ago, Swanson says that he’d often roof over existing shingles to save time. Ten years back he made it a practice not to. His crews strip every roof to the decking before installing a new one. 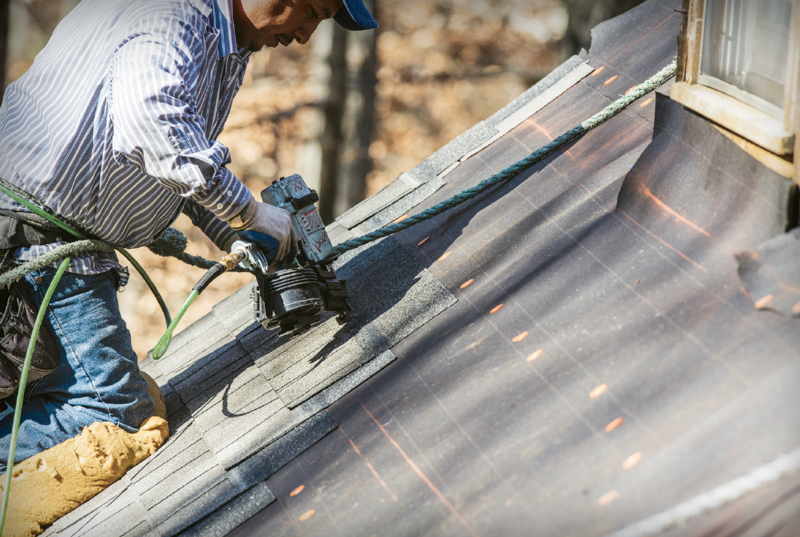 Typically, a roofing crew rips away old layers of shingles, which are tossed in containers and hauled to the dump. Stripping the roof down to decking, says Matt Weiner of ImproveWise, in Sudbury, Mass., allows roofers to get an accurate assessment of the condition of the structure under the shingles. “You can’t really tell what’s going on until your remove those layers,” he points out. A roof stripped to the decking, as well as an attic inspection, may reveal water-softened plywood or OSB, or sometimes compromised framing, all of which would have to be replaced before the new roof could go on. In some circumstances, it may be better to nail over existing shingles, but proceed with caution. Tearing existing roof materials off isn’t cheap. Indiana contractor Jeff Head, owner of Head’s Construction in Evansville, estimates tear-off adds $100 to $150 per square to what the homeowner pays for a new roof. On a 20-square roof that’d be an additional $2,000 to $3,000. Other roofers offer similar estimates. Swanson explains that cost by pointing out that it’s not just man hours but the materials that are not installed if the roofing contractor roofs over the existing shingles (i.e., drip edge, starter strip, flashings, ice-and-water, etc. ), and then of course the dumpster fees. Head says that some homeowners are aware of this—“You can find out anything on the Internet”—and he doesn’t rule out a nail-over on principle. Circumstances must be taken into account. For instance, sometimes he works with homeowners who are seriously short of funds, and don’t qualify for credit, but have to have a new roof. There’s also, he says, those who are sticklers about their property’s landscaping and don’t want nails, ripped shingles and torn felt paper scattered over the lawn and shrubs. In those circumstances, Head says that he will consider nailing over, but only if what’s already on the roof are 3-tab shingles lying “flat like shelf paper” to the roof surface. “I will not nail over a dimensional shingle,” he says. “It would look like hell.” And on the occasions when he does do it, Head says, “we put ice-and-water in the valleys” and carefully seal around penetrations (i.e., chimneys, vents, pipes, and stacks). Head Construction clients who have their roof replaced that way are eligible only for a three-year workmanship warranty from the company, rather than its standard five-to-10-year workmanship warranty. Of course, some homeowners know they can save a bundle by skipping the tear-off stage, which begs the question: how do professionals respond? Kulp says that his company will “walk away from jobs rather than re-cover a roof.” Kulp’s is a GAF Master Elite roofer, with many of its roofs protected by that manufacturer’s Golden Pledge warranty––which includes the cost of installing the product, and requires a GAF onsite inspection. That type of warranty would be voided if the new roof isn’t installed onto decking. Doing a roof over may mean that certain advancements in building science are not incorporated. by starting fresh, allthose elements become integrated. 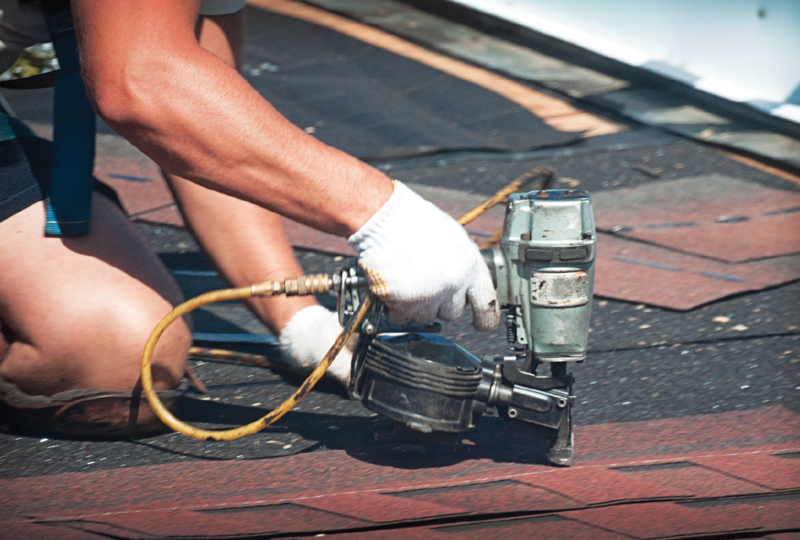 Shingling over an existing roof is perfectly permissible by building code in most areas of the country, and most roofers consider it a common industry practice. But for companies like Exterior Medics, in Springfield, Va., the reason to insist on tear-off as a matter of policy is building science. The company also has an answer for homeowners who insist that a nail over is all they want, because they’re moving and don’t care one way or another. Watson asks them: “When you go to sell, and the home inspector comes back and says you have two layers of roofing with evidence of deteriorating plywood and leaks, doesn’t that give someone buying the home a lot of leverage?” It does. Conversely a new roof, properly installed, is an attraction to buyers, and can be incorporated into the asking price. We tear off evr roof now because the insurance is paying us to. Can I go with a metal roof over existing shingles that are not leaking? As a roofer of 35 years : All of the above reasons given above are entirely correct. One thing I would like to note is shingles on top of shingles shorten the roof life by 50%. to 70%. In most cases a cover over will last less than 10 years, with the average being about 7 years. Do the math. Many of the older homes pre 1960 out her in the Pacific NW were sheathed with shiplap. As individual boards, shiplap moves like most wood. Over the years we have had issues on some of these types of roofs where leaks have developed due to the expansion literally causing the fasteners to tear when nailng falls on two separate sheathing boards. We started resheathing over these roofs with CDX or OSB and have eliminated any problems. Insert or Full Frame, Which Will It Be?